An unaltered photocopy of your DD-214, WD AGO, NAVPERS, NG or other military issued document clearly displaying your award of the USMC Recruiting Ribbon. 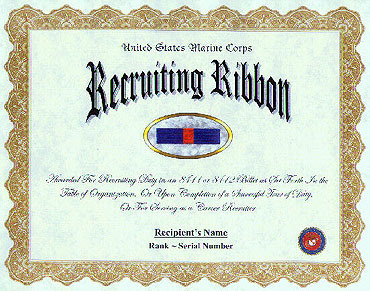 The Marine Corps Recruiting Ribbon was established on June 7, 1995, by Secretary of the Navy John H. Dalton. Award of the Marine Corps Recruiting Ribbon may be made retro-actively to January 1, 1973 to any person who meets the criteria set forth below. 1. Recruiters: Marines assigned to recruiting duty (MOS 8411) are eligible to receive the ribbon upon completion of a successful tour of duty (36 months of consecutive service in an 8411 billet). A Marine who extends beyond the basic tour of duty will be eligible for the award upon completion of the extension period. Marines returning for subsequent tours will be eligible for subsequent awards upon completion of each tour. A recruiter who becomes a career recruiter will be eligible to receive the ribbon upon assignment of the MOS 8412. 2. Extended Active Duty (EAD) Recruiters: EAD recruiters (MOS 8411) will be eligible to receive the ribbon upon completion of 36 months of consecutive service in an 8411 billet. Subsequent awards will be issued for each successful 36 month period. 3. Career Recruiters: A new award period for career recruiters will begin on the date which they receive the 8412 MOS. They will be eligible to receive subsequent awards upon the completion of each 36 month period following that date. 4. Command recruiters and Recruiter Aides are not eligible for this award. 5. For purposes of determining eligibility for this ribbon, the following definitions will apply: Recruiting Duty - duty in an 8411 or 8412 billet as set forth in the table of organization. Duty performed at the Recruiting Station level in the billet of USMC RS CO, XO, OPSO, OSO, or SGTMAJ. The Marine Corps Recruiting Ribbon is worn after the Navy and Marine Corps Overseas Service Ribbon and before the Marine Corps Drill Instructor Ribbon. This ribbon may not be worn on the Coast Guard uniform. Second and subsequent awards are denoted by 3/16 inch bronze stars. A 3/16 inch silver star is worn in lieu of the sixth award. /tel:cml (703) 696-2043/tel:dsn 226-2063/tel:cml (703) 696-2063//rmks/1. the purpose of this almar is to disseminate information regarding the establishment of a marine corps recruiting ribbon. 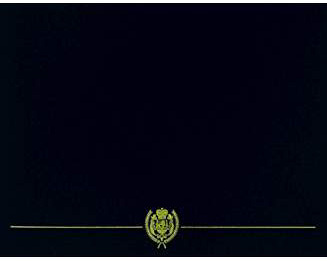 2. the secretary of the navy, by the ref, approved the establishment of the marine corps recruiting ribbon. 3. eligible personnel. marines possessing mos 8411 or 8412 who have served in an mos 8411 or 8412 billet are eligible to receive the subject ribbon. personnel who have served as a usmc rs co, xo, opso, oso, or sgtmaj are also eligible. a. recruiters. marines assigned to recruiting duty (mos 8411) will be eligible to receive the ribbon upon completion of a successful tour of duty. a marine who extends beyond the basic tour of duty will be eligible for the award upon completion of the extension period. marines returning for subsequent tours on recruiting duty will be eligible for subsequent awards upon completion of each tour. a recruiter who becomes a career recruiter will be eligible to receive the ribbon upon assignment of the 8412 mos. b. extended active duty (ead) recruiters. ead recruiters (mos 8411) will be eligible to receive the ribbon upon completion of 36 months of consecutive service in an 8411 billet. subsequent awards will be issued for each successful 36 month period. c. career recruiters. a new award period for career recruiters will begin on the date which they receive the 8412 mos. they will be eligible to receive subsequent awards upon the completion of each 36 month period following that date. d. command recruiters and recruiter aides are not eligible for this award. e. prior service recruiters (mos 8411) are eligible for this award upon completion of 36 months of consecutive service in an 8411 billet. a. recruiting duty. duty performed in an 8411 or 8412 billet as set forth in the table of organization. duty performed at the recruiting station level in the billet of usmc rs co, xo, opso, oso, or sgtmaj. 2 navy annex, washington dc 20380-1775, for decision. c. successful tour. completion of the prescribed tour of duty as outlined in par 5b. 6. precedence and subsequent awards. the marine corps recruiting ribbon will be worn after the navy and marine corps overseas service ribbon and before the armed forces reserve medal. second and subsequent awards will be denoted by 3/16 inch bronze stars. a 3/16 inch silver star will be worn in lieu of the sixth award. the award consists of a ribbon bar only. no citation or certificate will be issued. 7. retroactive awards. the marine corps recruiting ribbon will be awarded retroactive to 1 jan 73, reflecting the establishment of the all volunteer force. 8. awarding authority. authority to award the marine corps recruiting ribbon is delegated to co's. 9. action by co's. for those individuals currently on recruiting duty, ensure recruiters have met all criteria set forth above and record issuance of the award in the marine's srb/oqr. for those personnel not currently on recruiting duty, but who previously served on recruiting duty, determine eligibility from the members service record and, if eligible, award the ribbon.